Private customers and dealers can count on the Omegon brand for a wide and diverse range of products and the newest developments in the field of optical products and accessories. The product portfolio ranges from telescopes, binoculars, spotting scopes and microscopes to a large variety of accessories. 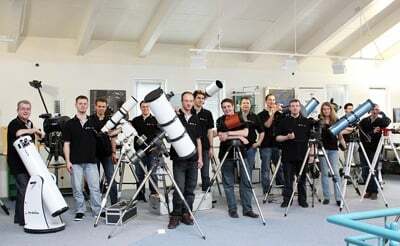 A special focus of Omegon is in the realm of amateur astronomy - where the optics can decide whether the user gets enjoyment or misery from their hobby. Also for nature lovers and birdwatchers, hunters, yachtsmen, golfers and for a wide range of other pursuits, Omegon offers the optimal equipment for beginners and professionals. Some of those behind the Omegon brand also follow these hobbies themselves and know exactly what is required and is most important for them. These people are also there for you with personal advice and support after your purchase of the product. At Omegon, quality is our most important requirement. Our aspiration to bring you optimum quality in the respective price ranges is not left to chance. All our products are subject to strict inspection, with testing carried out according to specific optical and mechanical quality criteria. Omegon does without expensive glossy catalogues and an overblown sales structure and passes the resulting price advantages on to the end customer. This means that the brand is a winner with its excellent price-performance ratio. For Omegon, the most important thing is the satisfaction of its customers, winning them over with the quality of its products and its fast and uncomplicated service. Our commitment means that you are guaranteed to get “more” for your money.